Welcome to the official website of Pitz Quattrone. Pitz's life and in turn, career, revolve around the Didgeridoo. The Didgeridoo or Yidaki, as it is properly called in its native Australia, is the world’s oldest musical instrument dating back tens of thousands of years. This magical instrument has taken Pitz from the Arctic Circle to the Equator. 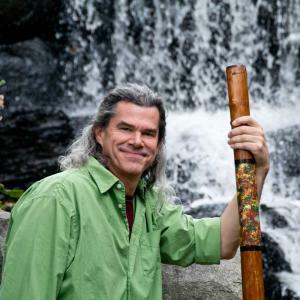 Performing with the Didgeridoo in various settings and passing on what he's learned about the instrument, has become one of Pitz’s lifelong missions. Pitz believes the Didgeridoo is the most musically versatile instrument that can be a critical component of any type of music. He also shares the health benefits of the Didgerdioo by teaching sleep apnea sufferers how to play Didge in order to drastically reduce apnea episodes. Massamba Diop of Baaba Maal's band and lead drummer on the Black Panther soundtrack says, "Pitz Quattrone in action, the man always give the best of him." Pitz is endorsed by David Dahwurr Hudson, General Manager of the Tjapukai Aboriginal Cultural Park, Queensland, Australia.